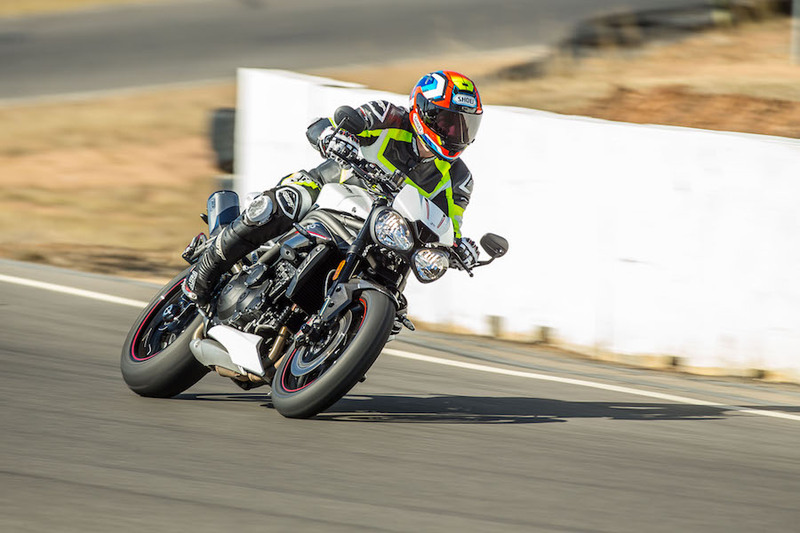 The first Speed Triple was touted as a hooligan, a tag it has carried well over its 24-year production run, and I now have a thorough understanding of why, after two sun-filled days with Triumph’s new-for-2018 Speed Triple RS. It’s the range-topping model in a three-tiered affair and it’s something a little special, with magical gold Öhlins suspension, trimmed-down weight, Brembo calipers and stunning lines. To make a bike beautiful it needs to be different and, with the RS’s unique aluminium twin-tube frame and stonking three-cylinder motor, it ticks a lot of those boxes. Beauty is not all about numbers and horsepower, but it’s also the way something makes you feel, and I know the RS made me feel good. 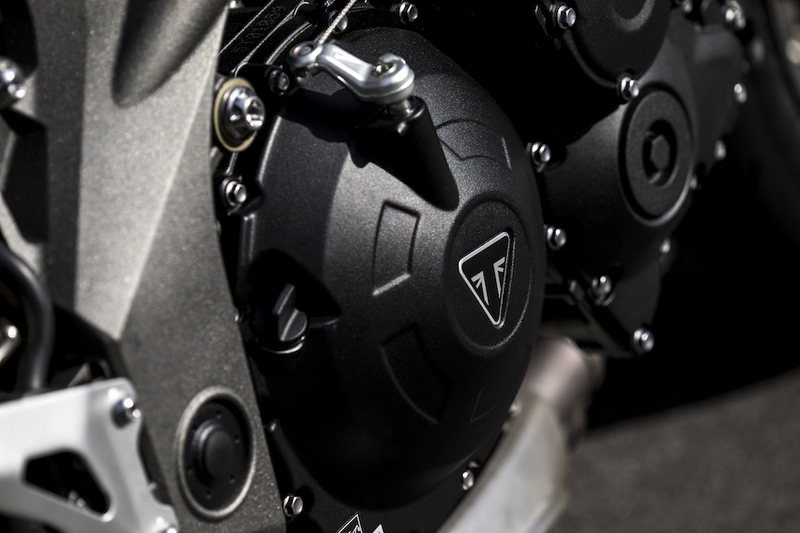 Triumph’s naked big-bore contender has been around in 1050 guise since 2005 and the basic engine configuration dates back way before then. Back to the very start, to the ’90s, when the Hinckley-based company rejuvenated itself from the ashes and started trying to recreate the magic it did once upon a time. The Speed Triple saw the light of day in 1994 and has taken on many different forms in its time (see breakout). One thing it has promised from the start, though, is its willingness for fun. It was never designed to commute to work on, or tour half-way across the world, it was designed as a Sunday morning bike or an evening blaster, something on which to forget the world’s troubles. Everything in this world is being scrutinised daily and weekly, rules and expectations are tightening. There are noise regulations to consider, pollution regulations to think about, and safety is one of the most important factors now instead of just ‘how fast does it go?’ of days gone by. If you trawl the internet, you won’t find a photo of a Speed Triple with panniers, or gentlemen in suits; it’s all wheelies, skids and smiles. 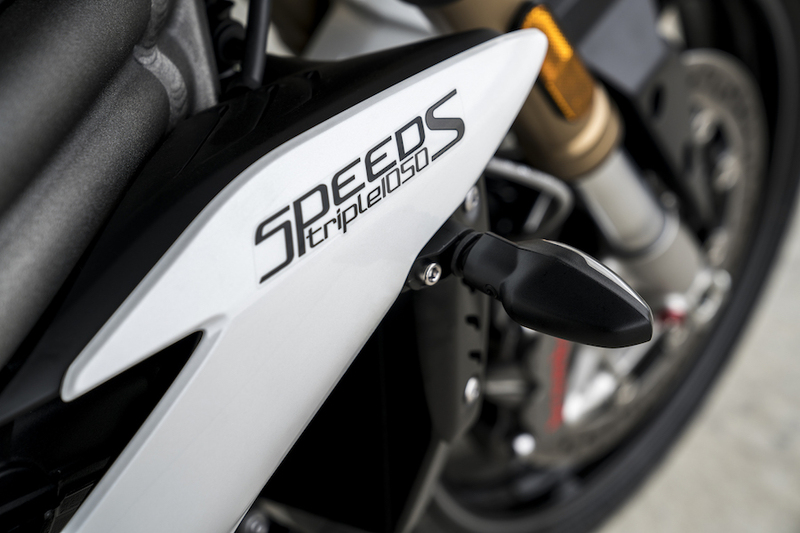 With this in mind, the 2018 Triumph Speed Triple had an exact criteria to meet while still retaining its made-for-fun attitude. Just like the models before it, the RS has been refined to have more power and less weight and its engine has come in for a lot of changes. It now pumps out a magical 150hp (112kW) and revs an incredible 1000rpm more than the previous model, taking the maximum rpm to 11,000. There’s also 117Nm of torque on tap, making for responsive and punchy power. 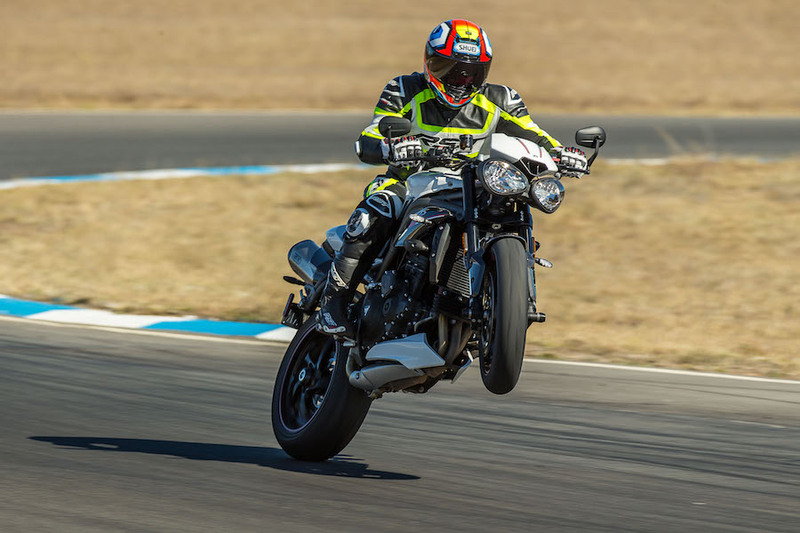 Triumph didn’t just remove a restrictor or give it more compression to get these impressive figures either; a lot of work has gone into the engine. The barrel has come in for some major attention while the head received a massive amount of work. Different porting is matched to higher-lift camshafts, which pound the valves open quicker, allowing more fuel into the combustion chamber. The valves have a stronger springs, too, to handle the extra rigour of the bigger cams. 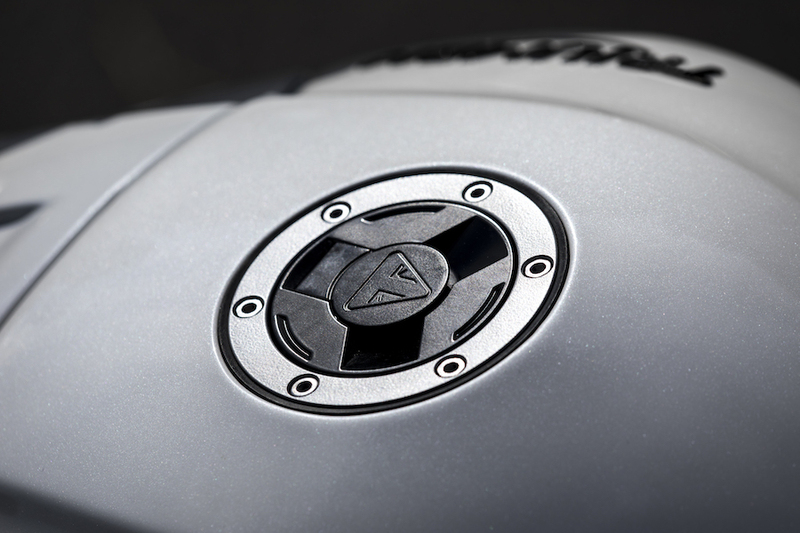 New pistons slip inside the lighter Nikasil-coated barrels and give a higher compression ratio. The whole top end of the motor has a racier feel about it and it was this top-end feel that made me fall in love with the bike. As I let the clutch out, it left the car park with ease, and had a perfect feel of gruffness about it to let me know it was there and ready if I were to twist the throttle – a bit like a good sheep dog trying to please on command. The bottom end has had the magic wand waved over it, too, with a lighter balance shaft, balancer drive gear, lighter alternator and a smaller starter motor all doing their bit to make the 1050 more responsive. The gearbox has improved out of sight as well, with many modifications aimed at making it precise and perfect. What was once perhaps one of the small bugbears of the bike is now as perfect as perfect can be. The selector drum and detent have been radically changed to get this new feel, and it’s Japanese-feeling now, which is good. This year’s exhaust is an Arrow system. I’m not sure the aftermarket pipe retailers are going to be so happy, though, as I can’t see a need to put a different pipe on the bike. It’s lighter than last year’s, has more performance and is better looking. It is impossible to remove any restrictors out of the back if you wanted to, but even on the racetrack the standard system gave out a mighty bark while being street legal. On a bike that has made many steps forward, the electronics have taken a giant leap. 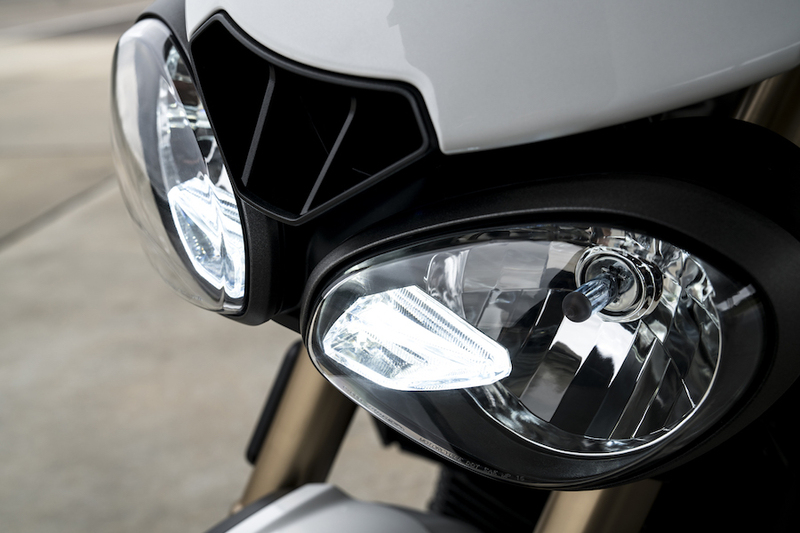 Triumph has taken stock and fitted the ultra-modern top-of-the-range system as fitted to the Tiger 1200. This means a TFT dash is now standard, and an Inertial Measurement Unit controls things such as lean angle-sensitive ABS and traction control. The Continental IMU is a massive step forward for the end user, something we mostly never see, and it is always working away in the background giving high-quality info to the bike’s onboard computer. The computer then makes decisions as to how much intervention we need according to the various programs in use. The fuel system and airbox has also come under scrutiny, with higher-quality injectors being used to make a better, finer combustible mix. Add that to the now more efficient airbox and you start to understand how Triumph has upped the ante compared to the 2017 model. Like most bikes now, the electronics are such an integral part of the bike. This year’s RS traction control, ABS, five switchable maps and engine brake assist is the same spec as last year, but in 2018 you get a whole load of extra goodies. The TFT dash for a start, with its never-ending story of information, is intuitive and easy to use. It tells you every piece of information you could ever care to know, be it fuel consumption to wanting to know if the dog got fed – it really does have plenty to play with. 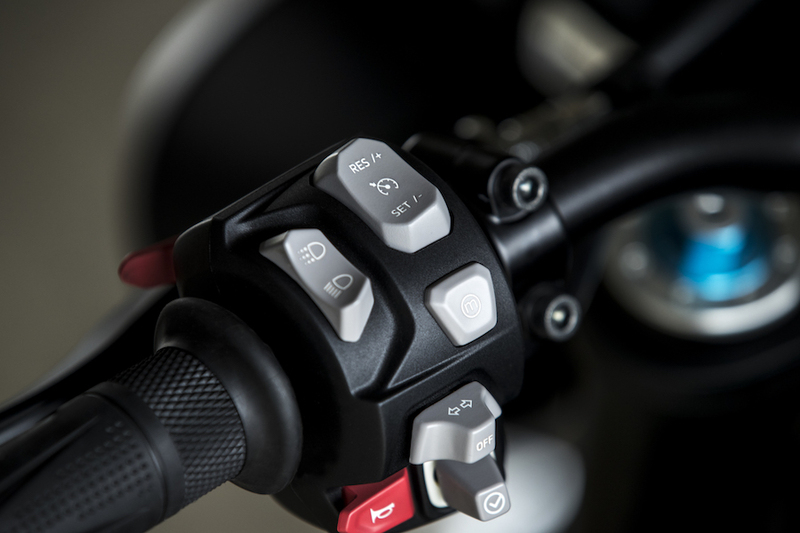 It’s also the platform for setting up the bike’s various rider aids by using the simple toggle switch on the left-hand switchblock and working your way through the programs. 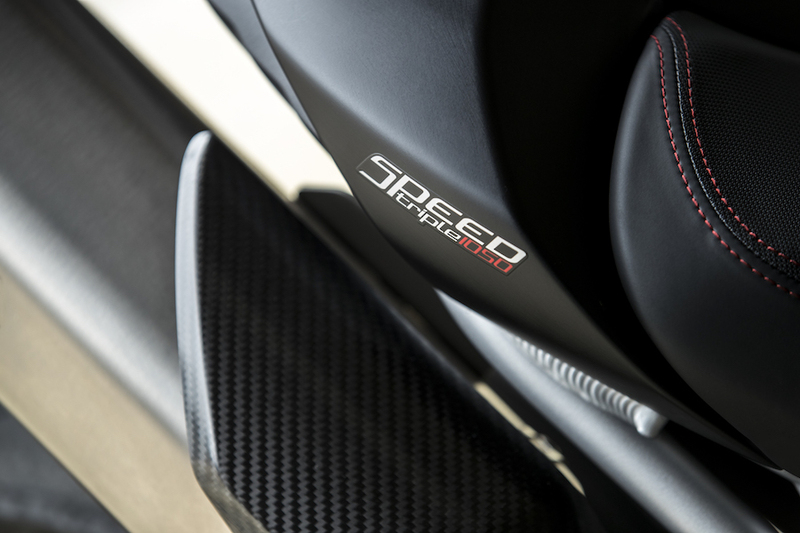 No bike would be new if it didn’t have something fancy, and this year the Speedy brags a few things. It’s got keyless ignition, which means if the key’s on your person you are right to go, so no digging through endless pockets. Then there is the excellent and simple-to-use cruise control, which integrates through the dash, easily letting you increase or lower the speed as you ride along. One feature I like a lot is the back-lit switchblocks, which bring vision to what was once a dark guessing game when riding at night. In the name of safety, a cool-looking daytime running light gives other road users more warning that you are on your way. It’s a nice bonus. The ride-by-wire system (which was fitted last year) is much smoother and easier to use, and is set up this year with a 75kW (100hp) Rain map through to a track-inspired setting, which both work well. It all works smarter, and with a setting for almost anybody – and, if not, you can make your own with the fully customisable rider mode. 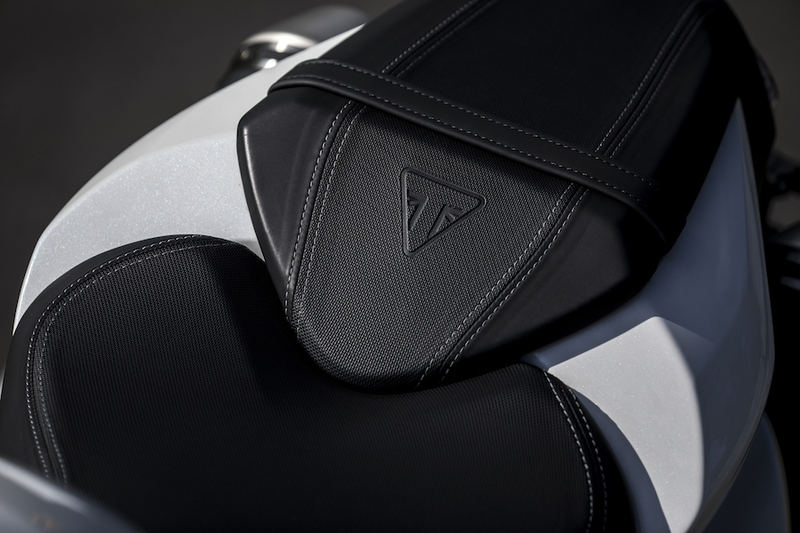 The most important part of any motorcycle is the chassis and, although the Triumph doesn’t sport a traditional twin-spar sports-oriented item, the tube system works extremely well. It doesn’t flex or wobble, and it lets the bike hold its line well. 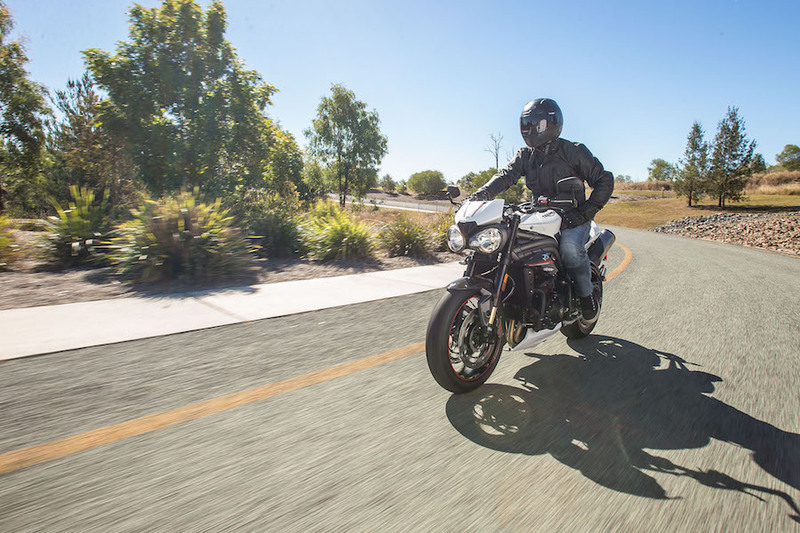 Triumph says the frame is sharper and focused, with more agility than ever before – and I’m not going to disagree. On the road, it was very manoeuvrable and light to change direction, while through Morgan Park’s fast left-hand sweeper it held its line even under protest from the severely bumpy track. It’s not a bad thing that, from the frame out, Triumph just fitted the best they could; the 43mm Öhlins NIX30 upside-down fork and the TTX36 equipped monoshock on the rear are both race quality. 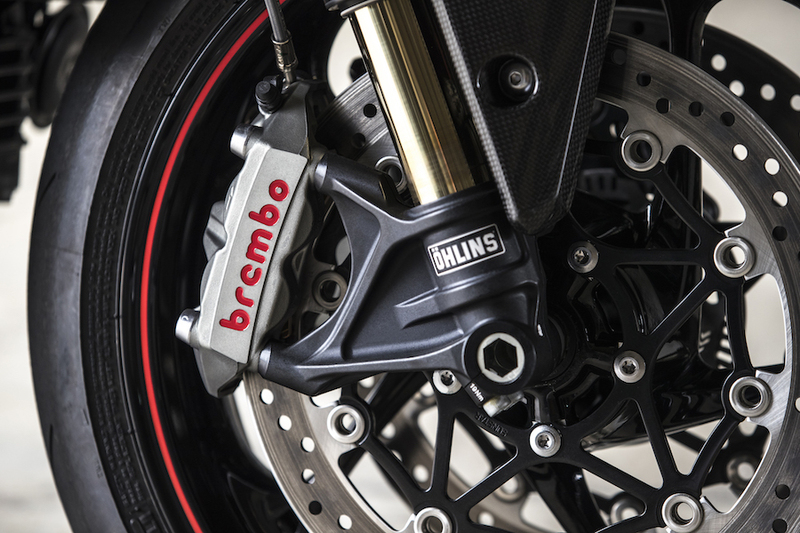 Then there’s the brakes; Brembo Monobloc M4.34 four-piston calipers up front and a Nissin twin-piston caliper on the back make the bike stop like a dream. 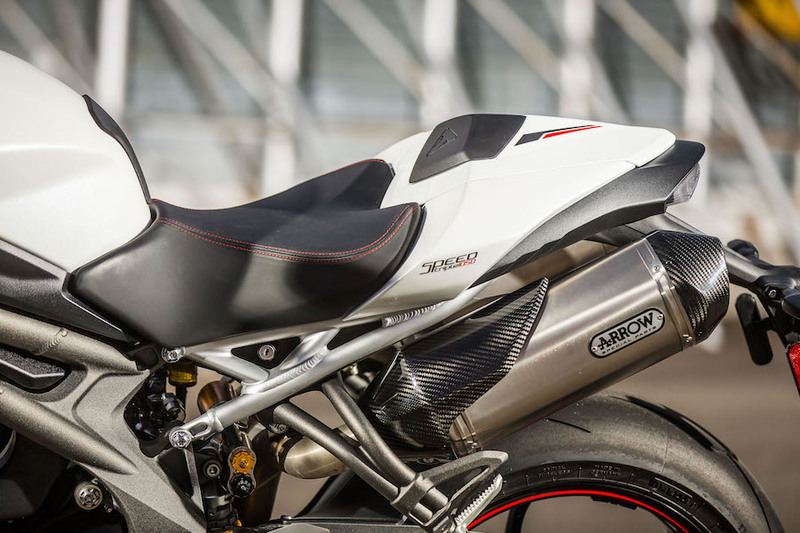 Pirelli rounds out the package with its incredible Diablo Supercorsa SP hoops. I don’t care what bike you are buying, those tyres, brakes and suspension are second to none when it comes to quality. We first rode the bike on a quick 200km stretch from Queensland’s Gold Coast through to Boonah and then on to Warwick, all of which offered varying conditions. The initial feeling was one of joy, with the RS doing everything nicely from the outset. It’s easy to snick into gear, the brakes work nicely around town, and it has a feeling of good balance at low speed. My favourite part while zipping around the Gold Coast’s traffic-infested outer suburbs was the quickshifter. My least favourite part was that the quickshifter doesn’t come standard and is an optional extra. The cable-operated clutch was smooth and precise but just a tad heavy, a small price to pay for keeping the new-found ponies moving forward rather than burning the clutch out. The Speed Triple feels great on the road, with handling matching any other bike I’ve ridden. It feels light, nimble and forgiving, its top-quality components doing their job at making the bike handle brilliantly. 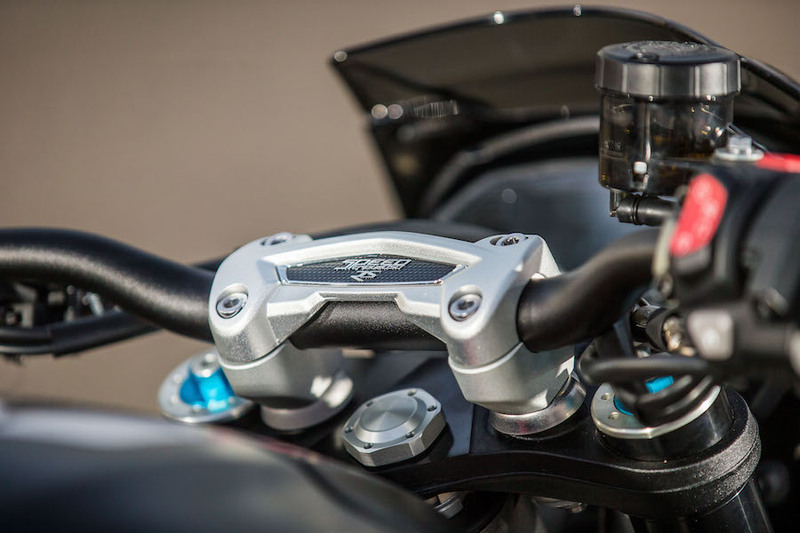 The front brakes have an interesting new feature too – the ability to alter the lever ratio of the front master cylinder from 19mm to 21mm by turning a small adjuster behind the brake lever. It is something used in racetrack circles and alters the feel of the brake; a nice touch. I found the ergonomics to be pretty well spaced out, and after a couple of hundred varying kilometres I felt fresh. I did play around with the compression and damping settings on the Öhlins though, softening the fork and shock off by three or four clicks each, and that greatly improved the bike’s ability to soak up small bumps. If I had more time, I would have taken preload off the front and, if I owned the bike, I’d put a softer spring on the back with less preload to give what I would expect to be the perfect ride. Day two was spent at Morgan Park Raceway and it was here that the bike shone. 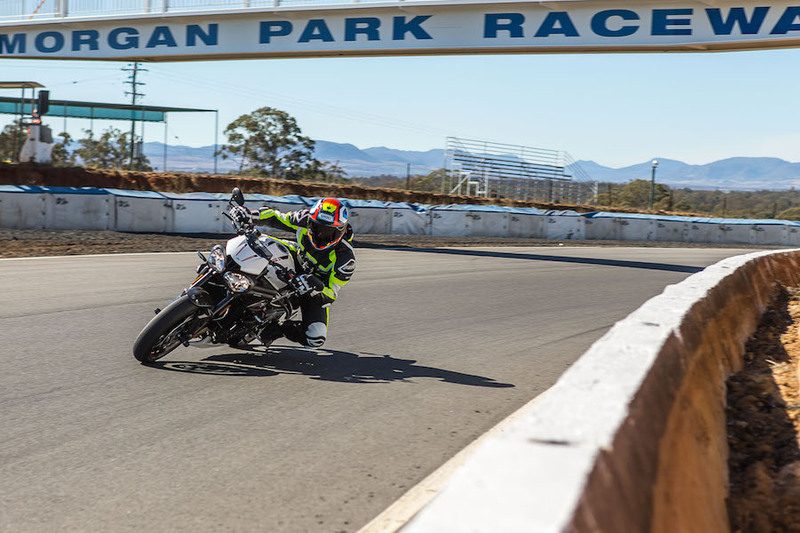 I’ve ridden a Speed Triple at South Australia’s Mac Park previously, so I knew it was a fun bike on the track, but I also knew its performance and handling fell a little short compared to some of the other big-bore nakedbikes like BMW’s S 1000 R and Aprilia’s Tuono 1100. That has changed. Now it’s a match for those bikes, perhaps not with outright grunt but on a tight track it could now hold its own. The Pirelli Diablo SPs have an incredible amount of grip for OEM equipment, and the rest of the package backs it up. 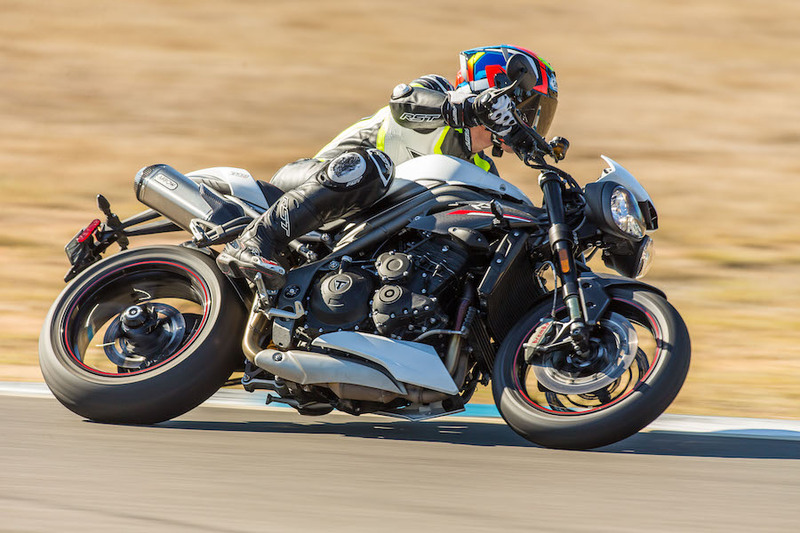 For the first time, Triumph has made the Speed Triple not only road ready but race track ready too. I loved the up-and-down quickshifter on the track and, in conjunction with the new gearbox, it felt like a MotoGP bike to ride – well, almost. Wheelies were easy to do and the fun factor is really where this bike shines. I was having a ball out on track; the bike held its line and spun the rear wheel like a modern sportsbike. The sit-up-and-beg seating position probably even assisted me on the tight Morgan Park track. To go professional-fast, I found I needed to turn all the electronics off (as with all roadbikes), but I did test the Track map and that was good for A-grade fast! It worked well, and let the rear wheel spin and drive out of the corners fast, but nibbled at the performance just enough to make me feel safe. In terms of handling, the RS was stable and nimble, with perhaps a little headshake at crazy speeds over the rough and fast sweeper at the back of the circuit. In reality, a steering damper is a must for most track bikes, and if you were taking your new RS to the track I would be fitting one for peace of mind. 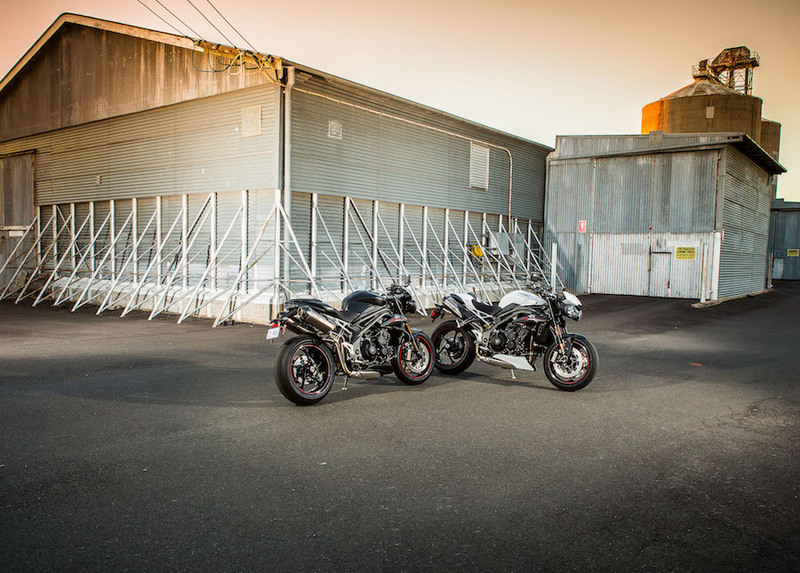 On my last lap, I took in the scenery and had a feeling of satisfaction coursing through my veins because here was yet another bike on the market that has widened its scope to be racetrack ready, as well as road-ride happy while still retaining every bit of its raw Speed Triple feel. That’s a winning combination in my books. What does it miss? There are a couple of notables such as the amazing quickshifter that should be standard fitment. At $500-plus (gulp), it’s an expensive option, but at least it’s a plug-and-play affair. The other thing is that the rear spring is too hard for the road; I would have liked to see a softer spring with a bit more preload to make road riding smoother. 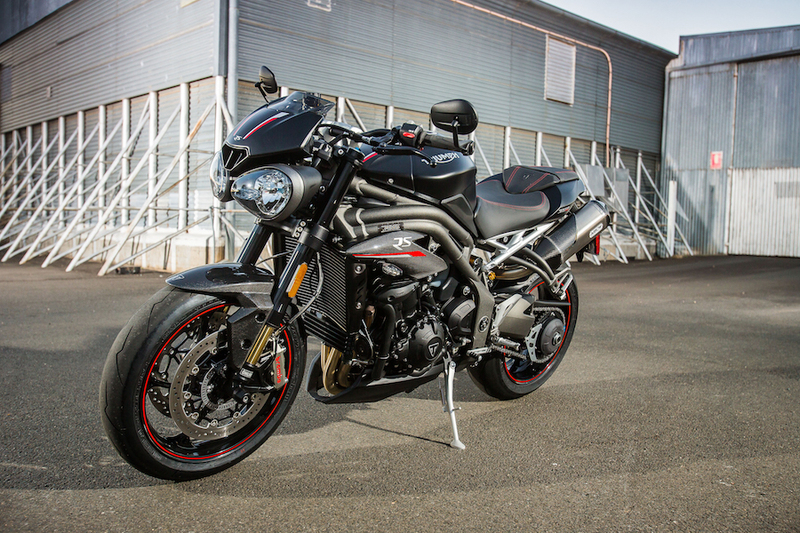 In saying that, the Triumph Speed Triple is leagues better than last year. It was a great roadbike before and now it’s also a great trackday bike. I knew straight away the Speed Triple was a thrilling ride. At $22,700, the RS is not exactly a cheap thrill, but you know what? You can’t take it with you.